The T350-HB tenor trombone is a no-holds-barred, top-of-the line Axial Flow Valve system. We and many of our customers have play-tested this new model in Elkhorn over the past year. We also enlisted the help of Toby Oft of the Boston Symphony to put it through its paces. We feel the results are striking and are confident that this horn is ready for your consumption. This horn is based on the T350, but with some important differences. In addition to the patented Harmonic Bridge, hard density cross braces improve the the response of horn. 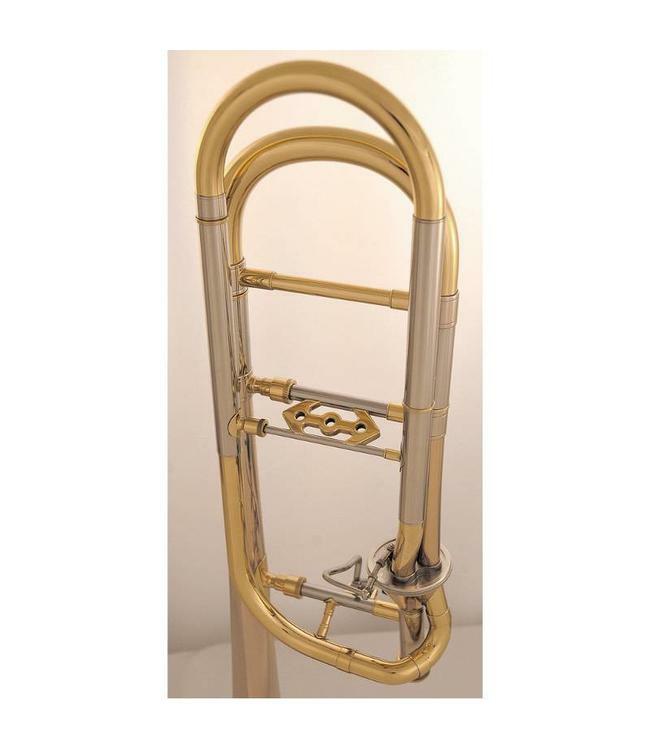 The rose neckpipe counters that harder density to achieve a perfectly-balanced tenor trombone. While developing the T396-A, we tested the patented Harmonic Bridge on our T350. We found that it worked extremely well with the Thayer valve, but unfortunately, production demands prevented us from adding it to more that one model at the time. After working hard to meet our ever-growing demand, the T350-HB is ready to give tenor trombonists the acoustical tuning that was previously only available on the T396-A. The T350-HB is available with 8" or 8½" bell flares in a variety of wall thicknesses and tempers with either soldered or unsoldered rims. In addition, you may choose from yellow, rose, or red brass with a clear lacquer finish. This system will work with any T350 or T350-E tenor trombone. For those of you whose horns have a bell tab, the tab will either need to be removed or filed down. The bell tab and screw are no longer needed with the Harmonic Bridge.